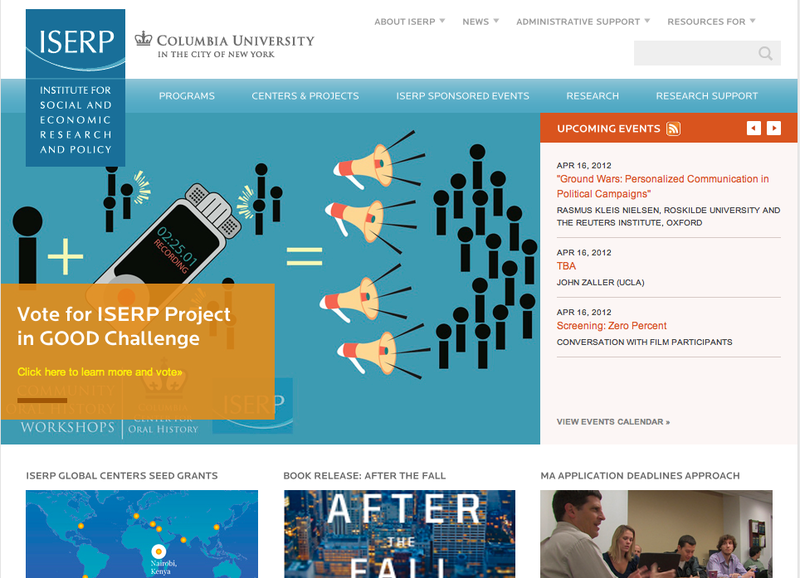 Founded in 1999, the Institute for Social and Economic Research and Policy serves as the umbrella organization for interdisciplinary research in the social and behavioral sciences and policy at Columbia University. It supports a wide array of innovative interdisciplinary research projects and research centers, by providing administrative support and infrastructure and sponsoring numerous public workshops, conferences, and seminars. Currently, there are several programs within the center, devoted to a wide range of topics related to social sciences. Its website offers a great amount of records, available free of charge: quarterly newsletters, press releases, announcements, director’s letters, as well as calendars of activities and teaching infos, with high updating rate. Large series of working papers are also retrievable with abstracts in various formats (pdf, html and text version). The website also gives access to the related journal Political Analysis, freely accessible up to abstract level, and to the center’s annual reports. Users are allowed to retrieve material by browsing or through a basic search engine, and many options are provided for items downloading. Clear categories and roll-over facilities permit easy navigation. are research structures inside or outside of universities focusing on a specific field of activity. In a large and complex universe, this selection highlights efforts to use the web as a key resource of ongoing research activity.